Jacqueline Fraysse-Cazalis (born February 25, 1947 in Paris) is a French cardiologist and politician. A member of the French Communist Party, she currently serves in the National Assembly of France, where she is a member of the Gauche démocrate et républicaine. She was elected to the 13th legislature on June 17. 2007, having served in the body since 1997; she had also been a deputy between 1978 and 1986. From 1986 until 1997 she served as a senator representing the same constituency. Fraysse has also served in various capacities for the town of Nanterre, whose mayor she was from 1988 until 2004. 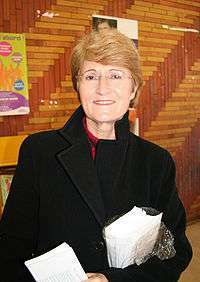 In her capacity as mayor, Fraysse was overseeing a meeting of the Nanterre municipal council on March 26, 2002 when Richard Durn opened fire on the group, killing eight and wounding nineteen. ↑ "Jacqueline Fraysse". National Assembly of France. Retrieved 12 January 2011. ↑ "Man Who Fatally Shot 8 French Officials Jumps to His Death". The New York Times. 29 March 2002. Retrieved 12 January 2011.